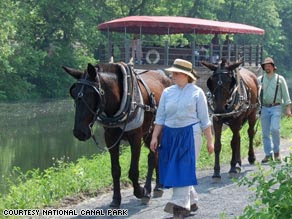 The Transportation Security Administration is enforcing federal law that requires background checks on those involved with the transportation industry to such an extent that mule skinners - AKA costumed, seasonal mule drivers at a historic park in Easton, Pennsylvania - must also submit to the same rigorous scrutiny. Sara B. Hays of Hugh Moore Historical Park is boggled by TSA's mandate. As she puts it: "We have one boat. It's pulled by two mules. On a good day they might go 2 miles per hour." The article also states that the "park's two-mile canal does not pass any military bases, nuclear power plants or other sensitive facilities. And, park officials say, the mules could be considered weapons of mass destruction only if they were aimed at something." Hays tried to get a waiver from the Transportation Security Administration. It responded to her request by "noting the Maritime Transportation Security Act of 2002 applies to all mariners holding U.S. Coast Guard-issued credentials." I hate that things in this country have devolved to the point that I have to state such an obvious truth, but: any government that thinks two ornery mules are a threat to national security, is a government that has clearly gone out of control and gotten too big for its britches.